Fully prepared for yet another hike in the hot sun, I opened the door and much to my pleasant surprise, there was a slight chill in the air. The air was crisp and clear and small clouds dotted the perfectly blue sky. It felt and looked like a mild winter morn and that was a nice change from the deep fat fryer that has been Oregon of late. By the time I hit Cottage Grove on the drive to the Erma Bell Lakes Trailhead, clouds had covered up the sky which was now its normal gray color, just like sky is supposed to be. Of course, by the time I reached the trailhead, the clouds had dissipated and it was quite warm again, but there had been a crack in the weather molar and we have a pending appointment with a dentist of hope. 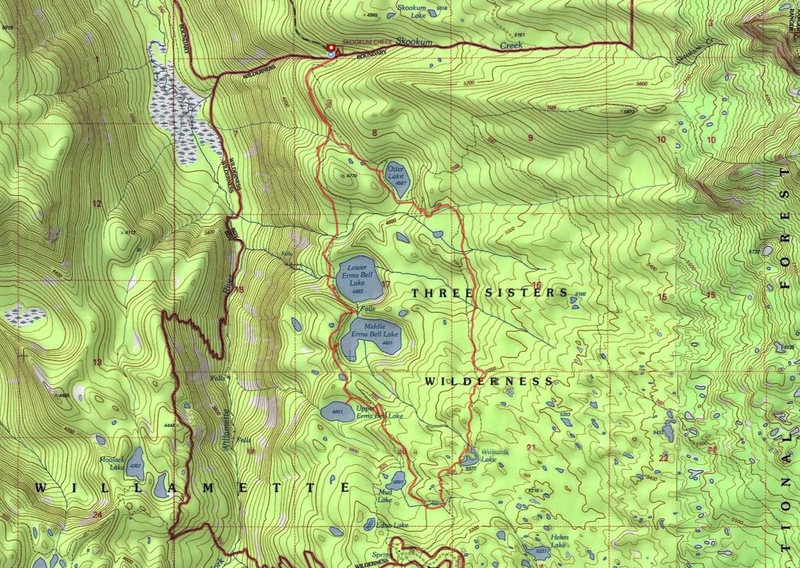 Located in the southwest corner of the Three Sisters Wilderness, the lakes are closer to Waldo Lake than they are to the Three Sisters. Allegedly, this is a popular trail but there was only one other car at the trailhead when I arrived. Because there were no other hikers, this meant I experienced a higher per capita ratio of hungry mosquitoes. However, they were nowhere near as bad as the clouds of mini-vampires at Island Lake several weeks ago. A quick spray of Deet held off the bloodsuckers for the time being. After crossing Skookum Creek, the trail headed into a superbly lush forest. Tall trees loomed overhead like the ribs of a Gothic cathedral and the forest floor was covered by a shag carpet of ferns, vanilla leaf, and prince's pine. Huckleberry bushes were festooned with red berries, all looking like small cherry tomatoes. The trail was wide, well-defined, and covered with pine needles, my footfalls were as silent as a sleeping cat as I walked through the trees. The trail became a little bit less civilized when I took the left turn on the Irish Mountain Trail after 0.6 miles. There otter be a lake! Angling uphill, the trail wandered through the woods, beargrass, and small hopping tree frogs for 0.5 miles before arriving at Otter Lake. The lake is just gorgeous, sitting below the forested slopes of unseen Irish Mountain. Lily pads floated serenely in the lake's waters along with a couple of ducks paddling slowly in the middle of the lake. After a quick photo-shoot, it was off to Williams Lake. It was nearly 3 miles further to Williams Lake and its namesake trail wandered through forest interspersed with meadows. The meadows were all abloom with columbine, lupine, tiger lily, and spirea while the boggier meadows sported white feathers of bog orchid. Of course, the meadows were incredibly humid and I was soon as sweaty as a Sumo wrestler playing racquetball in a steam bath. The trail had been climbing steadily and the forest changed from lush to scrawnier and more open as I neared Williams Lake. The lake arcs in a "C" and I got to experience it twice as the trail hit each leg of the "C". Dragonflies flitted over the lake while puffy clouds formed and reformed over the water. It was a nice stop for a lunch and lollygag and I obliged. Williams Lake was the high point of this hike, everything else was all downhill. Of course, I mean that quite literally as the trail descended off the high bench, switchbacking down into the basin containing the Erma Bell Lakes. I thought a lake spotted through the trees was Upper Erma Bell Lake but it turned out to be the unappealingly named Mud Lake. Upper Erma Bell Lake, was later spotted in similar fashion and I followed a faint use trail down to the lake. The lake was ringed with vegetation and fish jumped here and there. While there was some blue sky, it looked like the overcast from this morning was returning. The trail passed several hundred feet above Middle Erma Bell Lake and I took another faint trail down to the lake, cursing my fate as I would have to climb back up on the return. Across an arm of the lake, the lake disappeared around a forested peninsula with a marsh of aptly named marsh marigolds greening up the shoreline. As the path left Middle Erma Bell Lake, a huge roar carried through the forest. You could almost throw a rock from Middle Erma Bell Lake to Lower Erma Bell Lake, unless you have a partially fused wrist like your intrepid blogster. At any rate, the lakes are quite close together and are connected by a massive waterfall. Another sketchy side trail provided a cliffy view of the waterfall and much photography ensued. Lower Erma Bell is large and round with forest encroaching upon the rocky slopes surrounding the lake. At all the other lakes, the trend had been to take a faint use trail down a steep slope to see the lake and Lower Erma Bell Lake was no different. By this time, the day was well into overcast and it even felt like it might rain. After the dry clambake that has been July 2014, it felt good to be chilled. Leaving Lower Erma Bell Lake, the hike's 9.1 mile long loop was closed by walking the last 2 miles through that incredibly lush forest I had started out in. Sunlight slanted in between the overcast periods and through the trees I could see the vast and deep canyon of the North Fork Middle Fork Willamette River, or the Fork Fork as I like to call it. On the way back, I ran into a party of 6 backpackers, headed towards Lower Erma Bell Lake. Not only were they carrying their packs but each hiker carried two armfuls of gear, including full 5 gallon water jugs. They were going to camp at a lake but were packing in water, what the....? That's a good recipe for hating backpacking and several of the women in the party already had the "hate this" look on their faces. Oh well, I enjoyed the hike and the mosquitoes enjoyed me. Thank you for this post! We are planning on taking this trip as backpacking with kids. No way we are carrying water, ha ha! We are going in mid-August and really hope there are fewer mosquitoes! You're most welcome! August should be fine,mosquito-wise...I hear they're pretty bad right now. This is a good kiddie hike, being short, not too steep, and lakes to play in. Also glad to hear you don't feel the need to pack water to a lakeside campout. Have fun!